The New York Times, Washington Times and the New York Daily News and others are just now reporting a story that is old news for Military Times readers — service members are resorting to extreme weight-loss methods to meet strict body composition standards. Marine Corps Times reporter James K. Sanborn first broke the story three years ago in July 2010, when it was revealed that a large number of service members were resorting to risky and sometimes deadly weight loss methods including dehydration, purging, diet supplements and yes — even liposuction. Doctors told Marine Corps Times then that often perfectly healthy, strong Marines walked through their doors wanting liposuction to pass the tape test. Failure would be a career-ending stain on their record, one said. Many in the military criticize current body composition measurement methods, saying they are inaccurate and do not reflect their appearance or performance as warfighters. In the Corps, for example, a Marine’s neck and waist are taped. A formula is used to determine if they are within standards. But certain body types with disproportionately thick necks or abdomens skew results even if a Marine isn’t overweight. Marine Corps leaders, however, defended the testing methods as generally reliable, cheap and simple to perform even in the war zone. Other more accurate methods require special, sometimes expensive equipment. 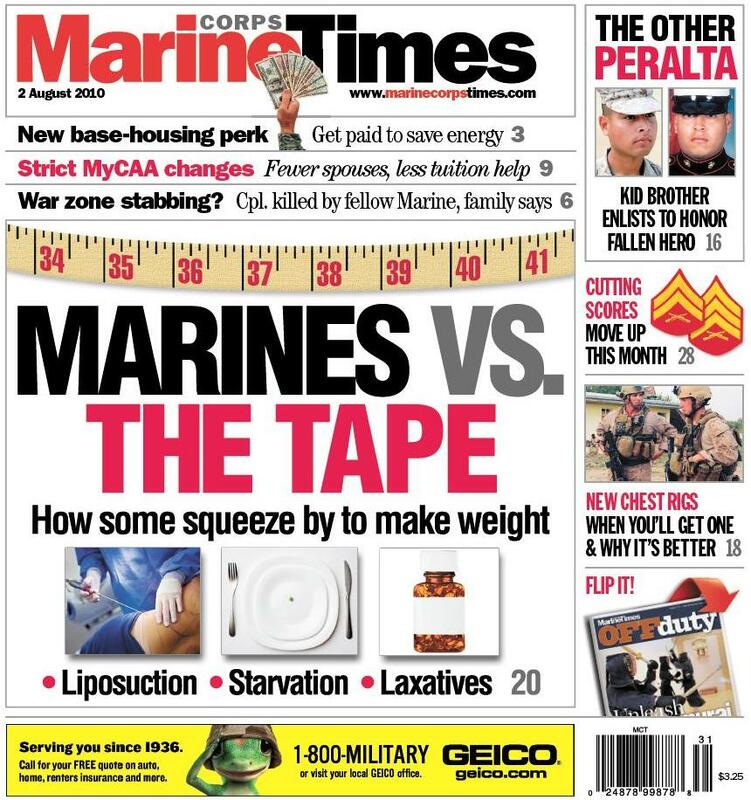 Check out Marine Corps Times’ original story that sparked our sister papers including Army, Navy and Air Force Times to find similar trends in the other services. We aren’t saying they are inaccurate. We are saying that it’s been proven time again by two Marine Captains on an independent study, physiologist from the university of Oklahoma, and various other fitness guru’s from around the globe. The Navy brass admitted it two weeks ago and many flight surgeons will tell you if asked…”whoever came up with the way to test body fat did not consult a physician” Say what you want but fact is we’ve kicked out both good and bad Marines since 2008. Some of the good ones were kicked out based on false information. We are Marines. We shouldnt be that close or over our max to even have to have the tape test done. Marines need to watch what they eat and how much they PT. You have to create an negative deficit in calories to lose weight. 3500 calories equals one pound of weight. Some Marines will wait for their unit/section to PT. You can PT on your own 7 days a week. Dont wait on someone else. You know your own body and what you can and cannot eat. Having to resort to these extremes is outrageous! I know that it can be done. I used to weigh over 200 pounds and had to lose it to be a Marine. I know how it feels and how hard it is but it can be done. For everyone, it’s different. For some, its’ fried foods, some, it’s sugar, some, it’s bread and carbs. You have to find what makes you fat and avoid it. As you get older, the harder it will be to maintain an ideal weight but as with everything else, you have to adjust. If we want to wear this uniform, we have to look good in this uniform. Do not disgrace it because we couldnt stop eating chips or pizza’s. Soda is a big culprit. Some feel that “it’s only liquid, how much weight could it put on me?” If it is full of sugar, it will pile it on quick! Not to mention kidney stones that come with it. There is no short cut to being in shape. It requires work…. Agree with most of what you’re saying. Without a doubt the biggest cause of this is nutrition, however, there are cases where the “body-builder” types are put at adisadvantage. More so if they are on the vertically-challanged side. Example, when I was in, I could bench press a damn Buick and run 3m around 22m. Being 5’7 and 180-190lbs or so put me 13-23 over everytime. And everytime, the tape would come out. Usually around 15-17% on the tape, and 12-14% on the callipers. Bottom line, the medieval method of measuring needs to come to an end. It’s 2013. You cannot sacrifice quality for quantity, no matter how convenient or fast it may be. We are talking careers, not numbers. I am by no means saying that lypo is a viable option. Those Marines obviosuly are not doing what it takes to cut the mustard. Sheepdog – Concur. You can tell who works out and tries to stay in shape and who does not. Working out on the neck machine right before a weigh-in isnt going to cut it. For the weight lifters/bench pressers, I think they should bring back the “alternate weight standards.” You’re right, there are Marines who are vertically challenged and who are body builders. They are first class PFT’rs and should rate the alternate weight standards. Those that just sit around and don’t PT until right before the weigh in are the ones who need to contribute to the drawdown effort. Afterall, it is the Dress Blue uniform that fit the Marine in the poster impeccably and that is what drew most of us to the Marine Corps. If I saw a recruiter standing at my hugh school that was clearly overweight, why on earth would I want to join the Marine Corps? we need to maintain our standards and what makes us different as Marines. Being physically fit and an impeccable appearance is what one of the things which makes us stand out and different from every other Branch. If we did the heart rate test like some other branches for the PFT (i.e. they get on a treadmill for 12 minutes exactly and measure their heart rate to determine if their cardio is gtg and they are physically fit) then we would have alot of people fail. Your heart rate doesnt lie and if you are one of those Marines who doesnt work out and PT on a regular basis, the heart rate test will tell. A Marine could look like he is in shape, but if his resting heart rate is upper 90’s and over 100 bpm, he is not in shape cardio wise. The tape test for Marines over weight and the weight limits taking no consideration for different body types is the most ridiculous thing I have ever seen and once again proves how far the Marine Corps is behind in some of it’s training methods. During my 8 years in the Marine Corps I never had a weigh in where I didn’t get taped. I was am 6 ft between 230-240 pounds at about 8-9% body fat and I would get taped and have it recorded on my fit rep that I was 16 percent , yes that number is still under the max but for someone like Marine O to say no Marine should ever be close to or over our max is absurd. I am a personal trainer as well as the 2013 Eastern All Forces Heavyweight bodybuilding champion where I stepped on stage at 213 pounds and 4% body fat but yet I was still 10 pounds over the limit for my height which would require a tape test. Just dumb.